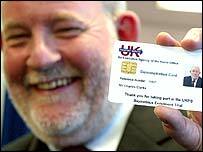 Home Secretary Charles Clarke has told MPs that ID cards will help counter, not create, a Big Brother society. The cards would allow people to show who they were, using one secure piece of identification rather than the multiple forms of ID proof now needed. Tory David Davis said Labour's legacy would be "surveillance from cradle to grave". The Lib Dems said the plans would not help fight terrorism. MPs are debating ID cards with a vote due at 2200 BST. Opening the debate, Mr Clarke responded to fears about civil liberties, saying: "There would be no compulsion on anybody to show their ID card in the street." And he stressed that people would have the right to check data held on them. The home secretary argued new passports including biometric data, such as iris scans, fingerprints and face scans, would cost £60-65 to produce. He says the ID cards would cost only about £30 extra. "It is best that we do give an assurance of a cap. I am not prepared to say at this stage precisely what that figure will be but I am prepared to say that before the bill leaves this House I will give such an assurance," he told MPs. Earlier he branded a London School of Economics report estimating a cost per card of up to £300 "technically incompetent", saying one of the academics involved was "partisan" and had adopted questionable assumptions. Mr Davis, for the Conservatives, said people were more likely to trust independent cost estimates than a government which had let previous computer projects overrun their budgets. He added: "If, 10 years ago, I had gone on the radio and said that within a decade a Labour government would try to do away with jury trial, remove Habeas Corpus, eliminate the presumption of innocence, introduce punishment without trial, and put house arrest on the statute book, they would have locked me up." Mr Davis said a future Tory government would repeal the legislation if it made it on to the statute book. Liberal Democrat Mark Oaten said that as well as the cost overruns there were concerns the cards might undermine, not strengthen, national security. He also said the biometric tests sometimes did not work, and he accused the government of repeatedly changing its case. "They started off with terrorism, then they moved to health tourism, then it was benefit fraud, then it was illegal working, and now finally they're talking a great deal about the issue of ID theft," he told MPs. "On each occasion the argument is put forward for the reason for the ID card and each time it's defeated." Labour MP David Winnick said he questioned ministers' judgement in bringing the bill forward and whether they had considered all its implications. His colleague Lynne Jones said the bill was "dumb" and should be "killed at birth". But former Home Office minister John Denham said: "All of the pressures which have led government to talk about an ID card scheme today will be more intense in 10 years time."